With Christmas time fast approaching followed soon after by New Years Eve, December is a very special month to gather up all your loved ones, reflect on the year that has passed and share in the celebrations before looking to the future ahead. 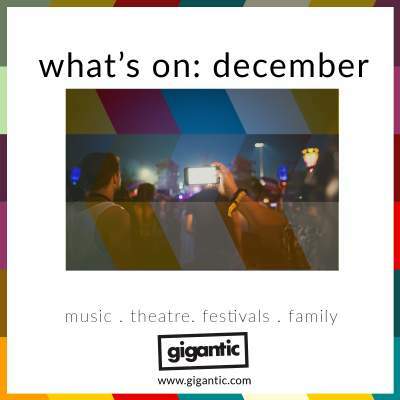 Gigantic has been with you throughout 2018, bringing you the best in theatre, festivals and live music. If you are looking for the best December events, keep scrolling to browse through our essential listings. There is nothing like a classic movie to make you feel all Christmassy! The Village Screen finds unique venues which perfectly suit their fantastic selection of cult films to create a truly immersive experience. This month, they have showings of such classics as Die Hard (definitely IS a Christmas film), The Muppet Christmas Carol, Home Alone, Elf and Love Actually at Victoria Baths in Manchester. They will also be screening Die Hard, Home Alone and Love Actually at 92 Burton Road in Sheffield. The Village Screen Christmas tickets are currently available. Found in the heart of the city’s Old Market Square, Nottingham Winter Wonderland makes its welcome return kicking off the Christmas period. No only can you take a spin on the romantic outdoor ice rink, but you can enter the frozen majesty of the Ice Bar complete with themed sculptures or retreat to the French ski style lodge Sur La Piste Bar and enjoy live entertainment and the VIP treatment. Nottingham Winter Wonderland tickets are currently available. Combining the power of metal with the intrigue of art rock, A Perfect Circle is the supergroup comprised of Billy Howerdel (Ashes Divide), James Iha (Smashing Pumpkins) Maynard James Keenan (Tool) and Matt McJunkins which first emerged right at the end of the 90’s. After a recording hiatus of fourteen years, they are back with new album ‘Eat The Elephant’ to play the UK! A Perfect Circle tickets are currently available. Elf: A Christmas Spectacular takes the classic blockbuster movie and turns it into a wonderful live performance starring David Essex as Buddy and famed actress Martine McCutcheon as his girlfriend Jovie. Come see the magical stage show when it arrives at Motorpoint Arena Nottingham during the last days of December. Tickets are sure to sell quickly so make sure you grab one for you and all the family today! Elf: A Christmas Spectacular tickets are currently available. Want to return to the happy optimism of your youth when boy bands were everywhere and you first learnt how to spice up your life? Then Stepback 90s is the perfect concert for you! Rounding up such major names as Peter Andre, B*Witched, 5IVE, Blazin’ Squad and more. Ellie Goulding is one of Britain’s brightest popstars. With huge hut singles like ‘Love Me Like You Do’, ‘Burn’ and ‘Starry Eyed’, she has sold three million albums worldwide and become one of the most celebrated singers of recent years. See her take to the stage at The SSE Arena, Wembley on Thursday 20th of December where she will top a bill that includes Dua Lipa, Bastille, Mabel, Jax Jones, Sigrid and more! Ellie Goulding tickets are currently available.